I should also point out that I have men with guns that surround them, often. And a great incentive for running for reelection is that means they never get in a car with a boy who had a beer. And that’s a pretty good thing. He never wants his girls to grow up, and he’ll throw them in a convent or deploy the Secret Service to defend his daughters’ youth and (I don’t think the subtext is too hard to parse here) their chastity. Obama used the same kind of humor at the last White House Correspondents’ Dinner when he threatened to send predator drones to kill the Jonas Brothers (I don’t imagine that played well with the families of civilians killed by very real drone strikes in the Middle East either). I’m sure if the Obamas had a son, they would muse about how he was growing up too fast and maybe joke about how he better behave. But does anyone think that Obama would be on TV talking about how he needed soldiers or drone strikes to keep away teenage girls? The President is tapping into a rich vein in American pop culture of dads trying desperately to keep their girls chaste. But it’s a sexist one. Sasha and Malia deserve better than to be talked about on national TV as though their gender makes them fragile. 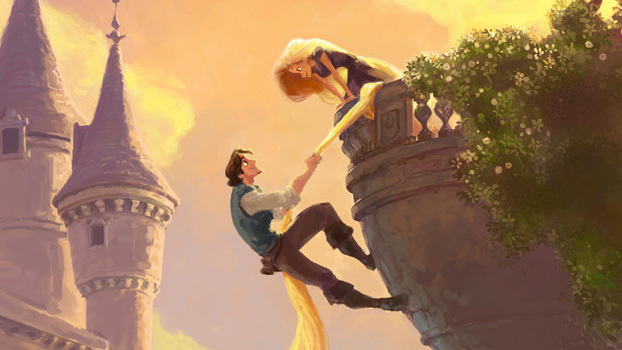 Barack Obama has exhorted Americans that “It’s up to us to ensure that our daughters and granddaughters have no limits on their dreams.” Would be nice for him to take that to heart next time he’s tempted to joke about treating them like Rapunzel. This entry was tagged Barack Obama, culture, feminism, gender, Malia Obama, Sasha Obama, sexism. Bookmark the permalink. I disagree. Most parents want to keep their children safe, and one way to do that is through magical thinking that we can protect them. If Obama had a son, I’ll bet he wouldn’t say he should behave, but rather express his fears (perhaps in different language, but with the same content) that the world can be a dangerous place. In fact, his subtext for a son might be racist rather than sexist because he would be implying how dangerous, statistically, it is to be an African-American male in this country. Also, not wanting his daughters to get into a car with someone who had a beer is not a fear of loss of chastity, but a fear of loss of life in a drunk driving accident. Yes I do think the “drone strike” was an unfortunate phrase. “Overkill “is how I would characterize it if the pun weren’t so insensitive. But “over-reading” to this teacher is a different kind of solecism, and since I think you’re a wonderful writer, and an insightful reader, I feel free to tell you I think you over-read the remarks. I don’t have a problem with parents wanting to keep their children safe, or talking about it. But I find the beer comment troubling because the context and the use of pronouns takes the danger of drunk driving and grafts it onto yet another round of wishing his daughters couldn’t date (I think Matt Yglesias gets at this part of it well here: http://thinkprogress.org/yglesias/2011/06/18/247947/barack-obama-will-unleash-the-secret-service-on-his-daughters-boyfriends/). More generally, I think young women deserve better than parents joking on national TV about using military force or parental authority to keep away any young men they might be attracted to. It’s patronizing, and being patronizing in such a gendered way and such a public way makes it far more pernicious than generic private fretting. Most parents have nostalgia for the past and fears about the future. But to fold real dangers like drunk driving or sexual assault in with the discomfort of your daughters flirting doesn’t do justice to real risks, or to the promise of equal personhood.